Italy has many special places to enjoy a weekend break or a longer holiday, with options to either overdose on cultural sightseeing, or just relax/eat/drink. I’d like to a minute to call out special attention to The Cinque Terre (“The Five Lands”), a series of 5 towns perched on cliff faces on Italy’s west coast. These towns are no stranger to tourism – I do believe they’ve been well-trafficked by American tourists after the villages were highlighted by Rick Steeves several years ago. No, the true reason I’d like to share this destination is that devastating flooding/mudslides all but destroyed one of the five towns, and the resulting bad press is crippling the livelihood of these towns. Sad part is, many of the regions best parts are still enjoyable – so let’s recap the lovely towns of Manarola, Riomaggiore, Corniglia, Vernazza, and Monterosso. My favourite part of the Cinque Terre wasn’t wandering the towns, although they are beautiful. It was the coastal path. A couple of paths run the length of the towns, and they are so popular that now there are permits required (easy and inexpensive) that give you access and help to keep the paths maintained. I’d encourage you to research these more, because not all paths are the same. The most popular and easiest walk is from Manarola to Riomaggiore, which is only 20 minutes and is called the Lover’s Walk, because of the wonderful views and the romantic ambience. Manarola has a nice vineyard area with an additional trail. Other trails are more difficult. 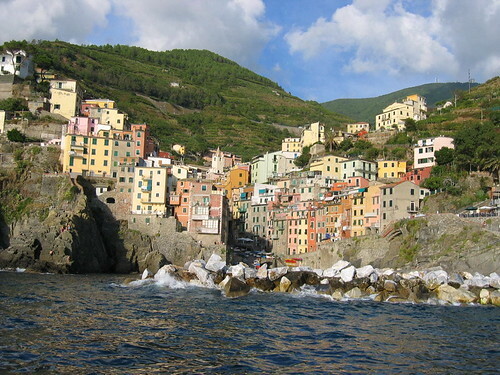 For example the Corniglia-Manarola takes you down to the shore, but can be steep in parts. And wow, the Monterosso-Vernazza portion is literally a stone wall along a cliff, which can be a little disconcerting for some. There are also several sections that are basically a giant staircase, so only those with high fitness levels will want to experience. However, we found the best views here, and if you take your time it can be enjoyable. It’s best to spend time planning your days; because the walks and trails offer endless combinations, you can do lots of routes, but also trails can close for maintenance and require you to hop on a train to pass parts – right now with the rebuilding effort the situation is changing. The region you’re in is Liguria – a name I have a hard time spelling/pronouncing. That doesn’t change the fact that it has some of the best food in Italy, and that’s saying something given how tasty a meal can be in places like Florence. Perhaps my favourite thing to have here is the pesto – they say that pesto was actually born here, and whether it’s true or not, you will love the pesto dishes you get here. Slap it on some bread, order the pesto pizza, or have the tagliatelle, no matter what, it’s fresh and delicious. Seafood is also popular, unsurprisingly. Seems strange to say, but I found the closer the restaurant to the shore, the better the food. This rule doesn’t always work in other countries! Orata is a type of bream fish that you’ll see often on the menu. Mushrooms are also a popular ingredient – not so much on pizza but in other dishes. I didn’t see a lot of it on the trails, but perhaps it is more abundant inland. The Cinque Terre towns are connected by train, as mentioned. The main nearby station is La Spezia, which is located in between Genoa and Pisa. 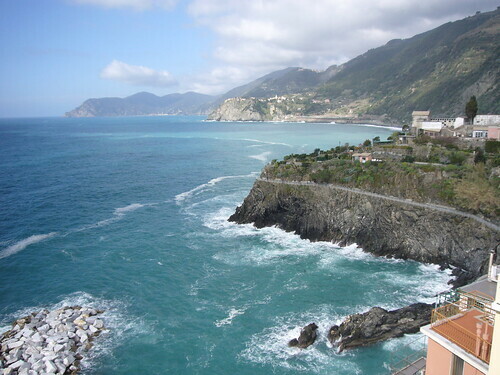 Both of those towns are a bit far for spending the night, but if you aren’t finding something suitable in one of the towns, I do suggest looking at La Spezia, which is a little less pricey.